I protested the inhumane and unjustified separation of children from their parents along the U.S. border while I was in Washington DC. This was fulfilling and heartbreaking and meaningful all at once, but then I felt guilty about my opportunity/decision to step away and enjoy an incredibly fun weekend with Bret’s college friends in Pennsylvania. On a two-hour shuttle ride, when I was feeling sad and directionless, I became friends with a 72 year old marathon runner who motivated me to start running again. We’re penpals now and I’m so dang grateful but now I feel so lazy when I’m not running regularly. 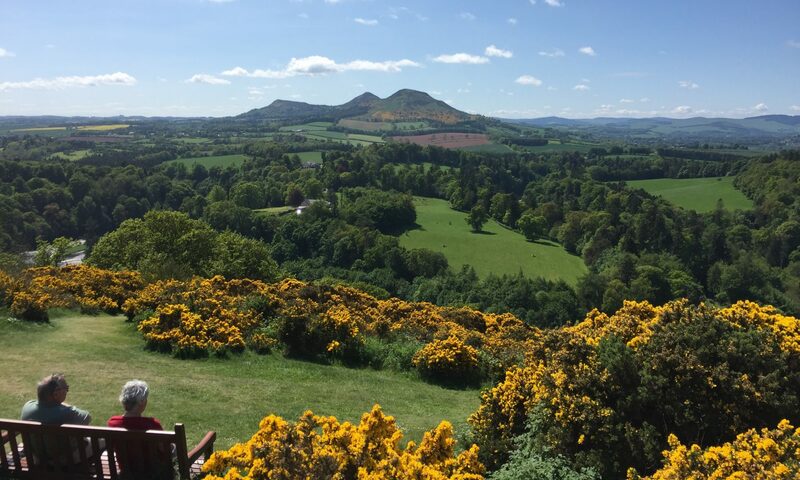 When I was feeling stuck on the side of a mountain I called home, two of my friends organized a girls weekend at an airbnb on a vineyard where we stayed with an awesome couple who had lived in New York, London, Australia and China before quitting their jobs to run that vineyard together (what a dream!! ), but I also thought of all the people who deserved a break more than I did… and felt guilty. I also visited Montreal, Canada for the first time, and spent time with good people at JMU, and the beach. I am SO grateful for these trips and these people who have embraced my sometimes unpredictable emotions. This summer, I had some thought-provoking conversations and some tough ones. Boone was generally difficult, and I’m so glad that season is over (more on the magical city of Winston Salem soon, I promise!) I’m still untangling ideas and I know I’ll have more to write about soon, but for now, in attempt to clear out my blog draft folder, here’s a new blog post I’d been working on about… well, food. In May, Bret and I were persuaded to try eating Whole 30 foods. I hate restrictive diets and the concept of ‘bad’ food so I was very hesitant to give it a go, but I’ve heard it was ‘life-changing’ and I’d been doing a lot of emotional eating over the past year which has made me feel worse, not better. Whole 30 consists of eating only ‘whole’ foods for 30 days. This includes: all fruits, all vegetables, nuts, eggs, and non-processed meat (i.e. grilled chicken, not a hot dog). It does NOT include any dairy (cheese, milk), grains (pasta, bread), beans (including chickpeas/hummus – my fave! ), alcohol or sugary processed foods (cupcakes, candy). I was not feeling the restrictiveness of it, but I liked how you’re only supposed to eat this way for 30 days before you re-introduce your regular foods back in. It’s how some people realize that they have a food allergy (dairy) or intolerance (gluten) which is good to know, so I thought, why not try it out? Thankfully Bret was also on board which was important since we usually cook together or take turns cooking dinner. I was surprised that, for me, the first few days were easy. We ate a lot of avocado omelets, fruit and spinach smoothies, and simple but wonderful dinners like shrimp gumbo and salmon (me) or chicken (Bret) with Brussels sprouts. Bret especially loved that he could still make his favorite meal: well-seasoned potatoes, onions, and eggs. Whole30 doesn’t support snacking, but I ignored that rule and regularly snacked on nuts (cashews, pistachios) or apples with almond butter which I LOVED whenever I felt hungry. 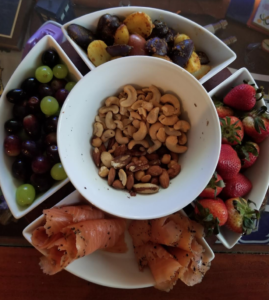 Here’s an example of some ‘movie snacks’ that we enjoyed one night on the couch: cashews, potatoes, strawberries, grapes, and smoked salmon. That actually ended up being our dinner because we were so full! I missed baking trays of cookies and eating ice cream, but after about a week of Whole30, I didn’t mind so much. I was sleeping better, having less headaches, and generally feeling pretty good. I realized my sugar addiction was real. Eventually, I stopped thinking about the cookie dough in our freezer every morning. We probably could have continued eating this way for a full 30 days if we stayed home, but Bret and I travel a lot. We tried to find a stretch of 30 days when we were “mostly” home, but for us, mostly home meant that we had to abide by this really restrictive diet on a road trip to visit my family and then separately in airports and at work conferences, and that was not fun or easy. When I traveled for work, I packed lara bars and almond butter and apples (even though the fruit got my carry-on bag searched by TSA), but I wasn’t about to skip a free plated vegetarian meal that was served to me during a conference session just because it included some pasta. We both did better when we traveled together. 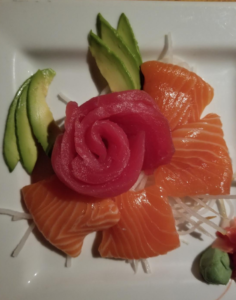 We fell in love with simple Made to Order Sheetz salads (lettuce, veggies, hard boiled egg, avacado, olive oil and vinegar) and as a serious sushi lover, I even came around and tried Sashimi – aka raw fish served on a plate (no rice!) and it was surprisingly my favorite thing I’ve ever ordered at this restaurant. I mean… look at this presentation! Basically, we did our best, but, from the beginning we agreed that we were not about to limit ourselves to meat, fruit, vegetables, and nuts while visiting one of the food tourist capitals of the world: Montreal, Canada! So we didn’t. We did Whole25ish (25 days instead of 30) and then we indulged on some of the most beautiful bagels on the planet, cheese covered French fries, and loveliest pastries my eyes had ever seen. To be clear, I knew I was over Whole30 because I went for a cheese pastry before I even left the New York airport. 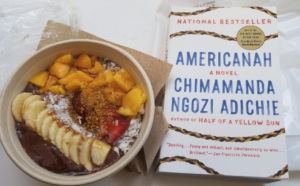 I’ll save those pictures for my future Canada post, but, I’ll leave you with a Whole 30 dinner I ate solo while I was in D.C.: an acai smoothie bowl topped with mango, raw coconut, bananas, bee pollen(? ), I don’t even know. It was good, though. And later, there were free brownies that were offered to me and I know I could have said no to but they were amazing and I didn’t regret this one “non-compliant” dessert at all. Although, it did make me appreciate that occasional brownie instead of expecting to have a handful of cookies every day, sigh, I can’t deny that it was a good practice to swap out my love for cookies with some fresh fruit. For the most part, I really liked the way I was feeling when I was eating lots of fruit and vegetables and basing my meals around eggs and seafood. It felt good to have so many ‘whole’ snacks like nuts in my diet, too. Truthfully, I used to eat fruit smoothies and salads on a regular basis, so it was a good reset. We thought maybe we could find a stretch of 30 days to do this again when we’re both home for a whole month, but that month doesn’t exist. Since May, I’ve been in DC (work dinners! ), we were in PA and loved eating at Bret’s hometown sub shop and pizza place, we reunion-ed with friends at JMU (donuts! And bar hopping! ), we spent a weekend at the beach (I threw some apples in the cooler but alongside ice cold peppermint patties). And in honor of Bret’s birthday month, we ate a lot of pizza. My work travel picks up in the fall and then it’s Thanksgiving, so, basically, we’ve done our Whole30 stint for 2018. I guess I will say Whole30 showed me two things: how to not be emotionally dependent on food, and how to break a sugar addiction (kinda). Mainly, it gave me a good model for the type of food I want to eat on a regular basis when I’m working from home and when we’re able to cook our own dinners. I’m grateful for that, but there are a lot of things that I don’t love about Whole30: the emphasis on all-or-nothing, labeling dessert as a bad food, and how if you miss the tiniest detail like accidentally putting creamer in your coffee you’re supposed to start back at Day 1. I guess there’s not enough forgiveness in Whole30 for me. And I believe life is too short not to indulge in an occasional scoop of Kline’s ice cream.